Kubler-Ross (1969). Grief is a natural response and reaction to loss in which an individual encounters an emotional suffering when something or someone the individual loves or has high hopes upon is taken away (Smith, 2012). Loss can be categorized as either physical or abstract, whereby the physical loss can be related to something that a person can touch or measure whereas the abstract loss... DABDA, the five stages of coping with dying, were first described by Elisabeth Kübler-Ross in her classic book, On Death and Dying, in 1969. They describe the stages people go through when they learn that they (or a loved one) are dying , beginning with the shock (or denial) of the moment, and up to the point of acceptance. Kubler-Ross E. On death and dying. 1969 New York Macmillan. 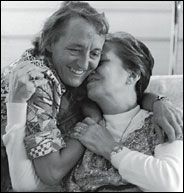 Elisabeth Kübler-Ross A psychiatrist who wrote the bestselling On Death And Dying (1969), which described ﬁve stages that dying people go through.